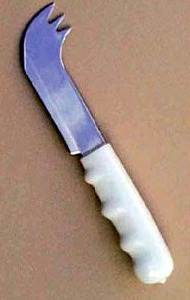 A rocking motion using the curve of the knife blade will cut your food with the use of only one hand. Use the forked end for spearing your food like a regular fork. 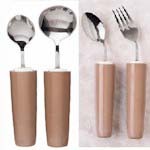 The three pronged fork end can be used as either a fork or a pick. 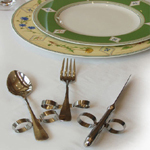 Ideal for people that that have limited hand strength, one handed eating ability, or grasping difficulties.